Location: Cole Art Studio, in the downstairs of Cole Gallery at107 5th Ave. S., Edmonds. By popular request Amanda, for the first time, will share her insights on how to capture the subtle personalities of her popular birds that are constantly in high demand. 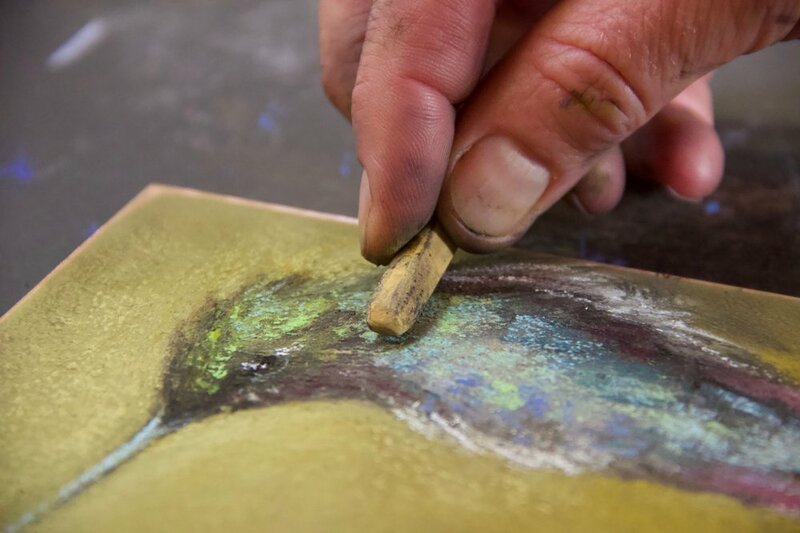 In this 2-day workshop she will teach you how to prepare copper plates to draw on, and how to create captivating little bird portraits concentrating on composition, facial expressions and color. Plan to leave with a small flock of bird paintings over the weekend. HARD PASTELS: (10-30): Girault or NUPastel - a variety of darks and lights. You can pick up NUPastels by the stick (from Dakota). These are Amanda’s favorite colors for skies and water and scumbling techniques. Sketchbook- Small personal sketchbook in any size. Amanda likes “Strathmore Toned sketchbooks” in either gray or tan for doing thumbnail value studies. Photo references of landscapes to bring for inspiration of what you want to paint. KEEP IT SIMPLE. Think 3-5 big shapes. No pets or intricate detailed photos please. Instructor will have inspirational photos as well. *For supply fee (please bring cash or a check to the instructor), Amanda will provide copper, gator board, sanded gesso medium, roller and sandpaper, as well as lecture, demo and hands-on guidance if people want to try preparing your own surface boards. If possible, she will have extra paper if people want to purchase more from her. Instead of a flat fee, these items will be available to students as separate purchases, so that you can pay as you use them, and aren’t paying for things you don’t use.